First of all allow me to congratulate the publishing houses, the book sellers, the florists, the illegal flower mongers for the success. Today I decided to visit the book stands scattered along La Rambla de Catalunya and Passeig de Gracia. It was hot in Barcelona. A beach day. The first very hot day of the year. Fortunately I took my Coolpix instead of the big one. My back was sweating under the backpack. People shoving me all the time. When Sant Jordi comes, you are supposed to buy a book and give away flowers. I couldn't concentrate on the books. I finally bought a small one on digital photography but once I got home, in the nearest bookshop. I did the same with the flowers. It is a real nuisance for me to buy the flowers early in the morning and carrying them around all day till I get home and handle them to my wife and daughter. Why would I do that if I have a florist a block away from home! Oh, no, tradition is tradition and people enjoy some sacrifice. There were authors dedicating books and long lines of people waiting. This year I noticed different flowers. 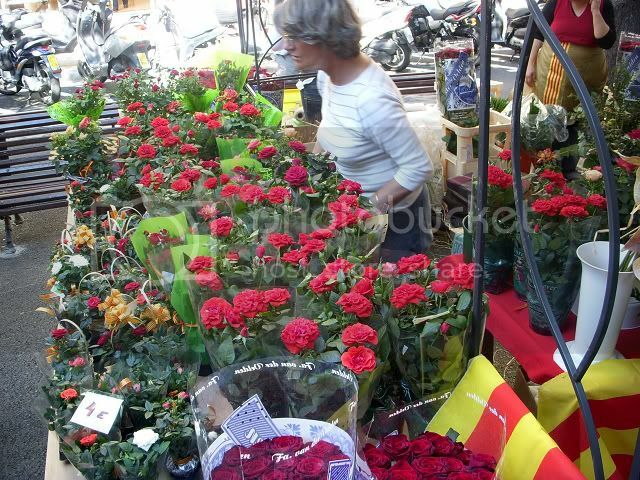 Many red roses were painted or tinted with some blue imitating FC Barcelona colors. Others were strange like these wire flowers. great photos, carlos! i was bragging on your blog to some people in vermont - esp the market views of fish & olives - yum! Fortunately I was also there on April 23rd, bought my wife a rose, bought myself several books, mainly on Photography from La Central, struggled to take photos in the crowd. Indeed a beautiful sunny day, the vibe of the city was amazing.